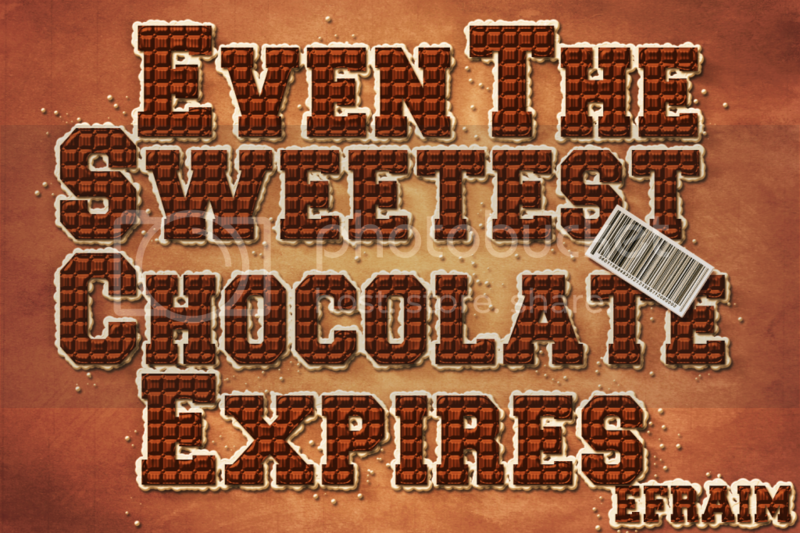 This tutorial explains how to create a simple pattern, then how to use it along with a couple of Layer Layer Styles to make a chocolate bar like text effect. It then explains how to modify a simple brush to add a nice filling to the text, and finally, adding some adjustment layers to complete the effect. The tutorial explains how to create the pattern to show some useful tips and tricks, but the pattern is also included in the Resources section if you want to skip that part. Bows Set 2 by ro-stock. Edit: The deviation has been deleted. Here are two alternatives Bow 2 PSD, or Christmas Bows 7. A Special Thank You! 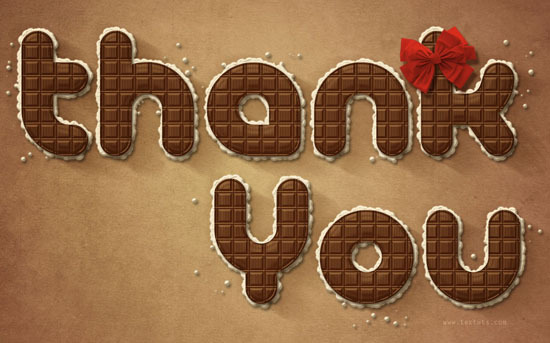 To all textuts‘ readers, followers, subscribers, and fans. I really appreciate your amazing support, and it means a lot to me. July 22nd was textuts‘ first anniversary, and I thought I’d take this opportunity to thank you all for making this happen! I always love to hear from you, so if you’ve got anything you’d like to say or suggest, just go ahead and send me a message through the contact form. Create a new 1250 x 800 px document. Set the Foreground color to #fece01, and the Background color to #e8661b, and create a Radial Gradient from the center of the document to one of the corners. Place the Yellow Vintage Paper Texture on top of the Background layer, scale it down till it fits properly in the document, and change its Opacity value to 50%. Click the New Adjustment Layer icon at the bottom of the Layers panel, and choose the Hue/Saturation adjustment layer. Change the Hue value to -10< and the Saturation value to -40. Click the New Adjustment Layers icon once again, but this time, choose the Vibrance adjustment layer. Change the Vibrance value to 100 and the Saturation value to -40. We are going to create the Pattern right now. So create a new 30 x 30 px document with a White Background. You can zoom in until the document is big enough to work with. Using the Rectangular Marquee Tool, draw a square that selects the whole document. Click the Subtract From Selection icon in the Options bar, and draw another rectangle that is 1px smaller than the first one. You can open the Info panel (Window > Info) to check the dimensions. Fill the selection with the color #888888. Press Ctrl/Cmd + D to get rid of the selection, then, repeat a similar process, but this time, draw the first rectangle so that it selects the white area only, and the other one should be 2px smaller. Fill the selection with the color #222222. Once again, draw another border that is 2px wide, and fill it with the color #c7c7c7. Finally, we are going to create vertical lines that are 1px wide, leaving a space of 2px between them. Use the Rectangular Marquee Tool and click the Add to Selection icon in the Options bar to create all the lines’ selections together. Fill the lines with the color #e9e9e9 and get rid of the selection (Ctrl/Cmd + D). Now, go to Edit > Define Pattern, and type in a name for the pattern. Back to the original document, create the text with the color #743d10. The font used is PicoBlack, and the Size is 350 px. Also, set the Tracking value to 25 to avoid overlapping. (You can get the Character panel from Window > Character). If you have multiple text layers, select all of the duplicated ones, then go to Layer > Merge Layers, or simply press Ctrl/Cmd + E. If you have only one text layer, the right click it, and choose Resterize Type. Drag the merged/ rasterized layer so that it becomes under the original text layer(s), and rename it to Shadow. We are going to use this later to create a shadow using the Motion Blur filter. This will create a simple border around the beveled text, so that the text won’t look flat at the edges. Click OK to get out of the Layer Style box. Check out what we’ve got! Create a new layer on top of the Shadow layer and under the text layer(s), call it Filling. Right click the text layer, and choose Create Work Path. Select the Filling layer so that it is the active layer, then, pick the Direct Selection Tool and set the Foreground color to White. Right click the path and choose Stroke Path. Choose Brush from the Tool drop down menu, and un-check the Simulate Pressure box. This will stroke the path with the brush. Hit Enter/Return to get rid of the path. This is what the filling should look like. Select the Shadow layer we created earlier, and go to Filter > Blur > Motion Blur. Change the Angle to -30 and the Distance to 100. Move the shadow around (using the Move Tool) so that it starts at the top edge of the letters, and spreads away diagonally. Change the Shadow layer’s Blend Mode to Multiply, and the Opacity to 50%. This should give the text more depth. 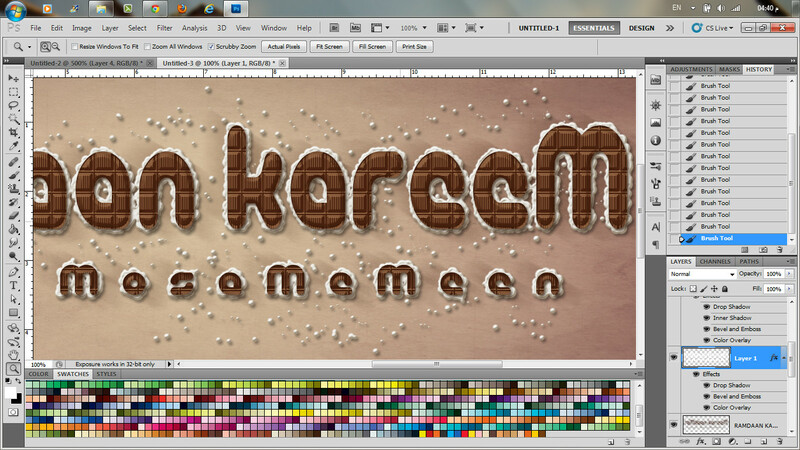 Now, start painting some scattered dots on the Filling layer, as if the filling is a bit scattered around the text. Open a bow form the Bows Set, and place it on top of all layers. Resize it and move it or rotate it till you like how it looks, and place it on top of one of the letters. This should enhance the color of the bow and give it more depth. Go to Image > Adjustments > Hue/Saturation, change the Hue to 5 and the Saturation to -10. Finally, go to Image > Adjustments > Vibrance, set the Vibrance to -5 and the Saturation to -10. The last thing we’re going to do is add some adjustment layers to make everything blend well. So click the New Adjustment Layer icon, and choose Photo Filter. Choose the Deep Yellow Filter from the drop down menu. You might as well need to adjust the colors of the Bow. The only adjustment made here is changing the Saturation (Image > Adjustments > Hue/Saturation) value once again, to make the colors a bit less bright. Finally, set the Foreground color to Black, create a new layer on top of all layers and call it Gradient, then, create a Foreground to Transparent Radial Gradient. Change the layer’s Blend Mode to Soft Light, and its Fill value to 30%. Congratulations for your baby’s birthday, and many many (and many more) thanks for sharing all these awesomely talented tips and tricks. Thank you so very much once again for your kind words. By the way, soon it will be my daughter’s birthday (well, one of my daughters indeed), and I completed the tut (result here: http://tinypic.com/r/qnvcyh/7) because she’s a huge chocolate fan (beside we live in Mexico where chocolat comes from). P.S. You don’t have to thank me for my previous comment, you deserve it. For the record, I’m designing since 30 years now and I can see when something is well done, and what you do is very well done, and not “easy”. Challenges are indispensable in our job. I really am speechless! This really means a lot. Happy birth day to txtuts.com and thank you for this explosive post. I loved it very much. hi . this is one of the greatest tutorials ever seen!!! so clear, everything explained, wow , im so impressed,!!! fantastic , Thank you!! thanks a lot for sharing ! I love it so much ! What an awesome tutorial !!! Made me hungry for chocolate !! Check out how mine came out !!!! Would you please post a link for your outcome? Awesome tutorial, i like it very very very much. Did you make sure to change the Size Jitter under Shape Dynamics to 100%? (As shown in the second image under Step 5). Hi there, I am new to the world of photoshop! But I must say this is such a lovely work! A quick question… can I do the above in CS3? Of course you can do it in CS3, and if you have any questions please leave a comment, and I’ll try my best to help. Wow! Super helpful tutorial! Never thought that making chocolate letters was that complicated. Thanks for this wonderful website of yours, I will be looking forward for new tips! can i download a psd file? If you have any questions about the tutorial please leave them in a comment, and I’ll try my best to help. Awesome!!! You explained it sooo well!! I didnt have any problem to understand you. It is a great job!! applause! I’m having some trouble with the stroke path. It comes out sort of beige instead of white – as if it’s not opaque, and the colors beneath it are showing through. I can’t figure out what I’ve done wrong. You might need to check the layer’s Opacity and/or Fill values (in the Layers panel), or the Opacity and/or Fill values in the Brush Options bar at the top of (when the Brush Tool is selected). All values must be 100%. Where can I get the contours you use? For example the Shallow Valley – Slope, I don’t have it preloaded in my photoshop and I could not find it online. 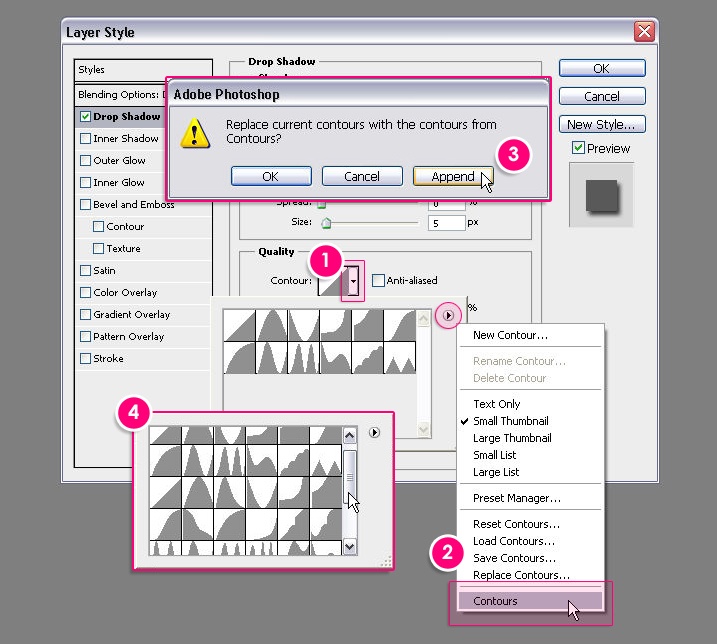 You can check this image to see how to load the contours. (This is mentioned in the bold part under the third image in Step 4). Thank you for the lightning fast answer! Easy and fast to do. When you want to translate them to dutch, with dutch pics as well, just ask me. If there is somewhere you’d like to publish this in Dutch you can do that, just please link back to the original tutorial here. thank you for nice design. Thank you so much!Great tutorial! OMG This is awesome. I never thought that you can make such a great effect by stork the brushes. Its just so cool, Thanks for sharing. Cool! Nice execution of the tutorial. Glad you had fun doing it, and your result looks amazing as well! SUPERRRBBBB TUTORIAL..!! 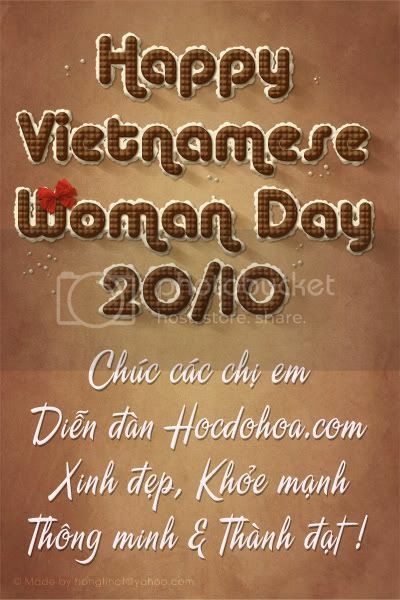 THANK U SOO MUCH…. Ps could this be set up as an atn file? I haven’t actually tried creating an action for this, but I think it should work. What a brilliant tutorial! Absolutely loved it. I’m still a newbie and would really love to do a similar thing with fruits but haven’t got a clue. Guess i’ll have to just do a bit of trial and error. Hopefully you’ll create a nice effect. Thank you very much, it’s beautiful & pro. Hi, I love your tutorial! But I tried this with Photoshop Elements 8, and Elements doesn’t have everything CS5 has, so halfway through I got lost and the result came out nowhere near the final product. I was just wondering, do you think I could still do it with Elements 8? Thanks! I’m not really that familiar with PSE, but I think that there are some missing parts that would make the result a bit different. Can you please tell me exactly where did things start getting different? Or what exactly is not found or missing? Hi, textuts. I love this site as well as loving other sites. Thanks for the tutorial. By the way, let me ask you a question: I want to be reminded of these tips and download via email. How do I do? Thank you so much for your comment, glad you do. As for your question, if you mean that you’d like to receive an email whenever a new post is published, then you can enter your email address here, and you’ll get the updates via email. If you mean something else, please feel free to add a reply. As for the pattern, it is available for download under the Resources section at the beginning of the tutorial. Just unzip it and load it (Edit -> Preset Manager -> Choose Pattern from the Preset Type drop down menu -> Click the Load button to the right, then navigate to where you saved the pattern file, click Load -> Done), and now the pattern will be available when you apply the Layer Style. Thanks alot! This really helped! I’m so silly, I was looking and looking, even searched on google, but I couldnt find the pattern! Thanks again, will start on my attempt at amazing chocolate tut! Have a nice day, love your edits!! Try this direct download link please here. If it doesn’t work, please add another reply. it’s gimme an inspiration for my course. Glad to know it did! Did you try googling the font’s name? If that doesn’t work please feel free to leave a reply. Can you update the bow link? Try this direct download link please here. The original deviation is not available though, so I can’t update its link unfortunately. 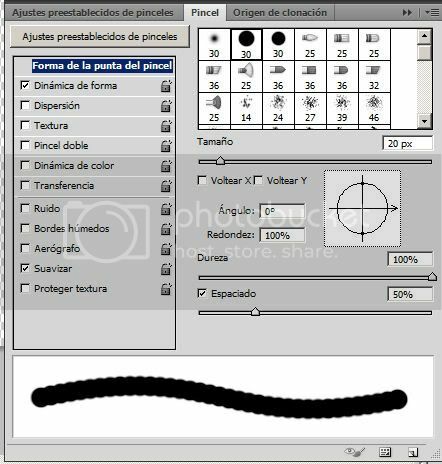 Select the Brush tool, and make sure that the Opacity and Flow values in the Option bar (at the top) are set to 100%. If the problem still exists, please feel free to add a reply. i like your work !! 😀 it’s really nice 😉 good job ! I am just speechless. What a design! Soon i will make such design. Thank you very much and i will come this site everyday. Thank you so much for your kind words, I really appreciate them. Glad you found the tutorials useful. guys can you pls upload a copy of the bows? i cant download it seems the creator deactivate hes account. Please check this comment, I think the direct link still works. You can buy the PSD source file for $3 here. i’m already stuck on step 2, whe i color in the edge with the color 88888 it gets a checker pattern? When you pick the Paint Bucket Tool, make sure that the fill type in the Options bar (at the top) is set to Foreground not Pattern. Hope this helps, but if the problem still exists please feel free to add a reply. So glad to know you found it useful. Thanks a lot for the comment, I appreciate it. 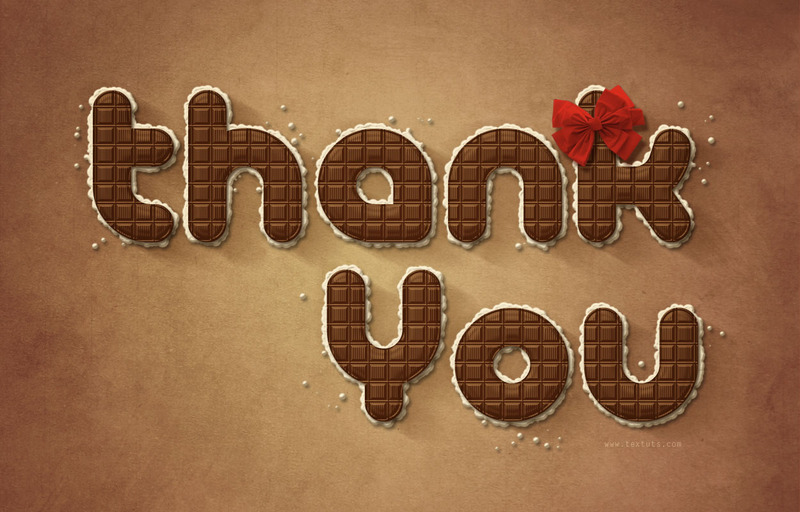 Thank you for such a brilliant tutorial – it’s easily one of the best PS tuts on the internet. Somewhat advanced in scope but done in such a fashion that I’d imagine anyone could do. 1) When creating the chocolate pattern, I didn’t see how to create the vertical lines in the middle of the pattern to complete the look. I just added more pixel wide selections but perhaps because I had ‘Add to Selection’ on it didn’t come through in the finished pattern. 2) I had trouble on the filling layer where you create the stroke path with that customized brush. I think I followed the steps correctly but when I finished creating the stroke path after the other steps it worked fine but the result was barely visible. I checked that my opacity was 100% and I don’t think I changed the blending mode from Normal so I’m not sure why it came out hardly visible. Anyways, I just duplicated the layer a few times and arrived at a similar product so all good. Thanks again for a GREAT lesson! Thank you so much for your kind words, they really mean a lot. I’m glad you found the tutorial useful. As for the lines, it seems like the step that explains how to create them was missing for some reason! (Sorry for that). But I fixed it now, and as you mentioned, you just need to use the “Add to Selection” to create the rectangles and fill them. ^^^ Nevermind my 2nd question above – I had only looked at the layer opacity not the actual brush opacity. Fixed and looking better than ever – thanks again! But what is the need of step 2? Step 2 is for creating the pattern that is used later to create the chocolate bar (with the layer styles). hi man 🙂 : i have a problem in step 6 ( texture ) i don’t have this pattren or i don’t know the way to have it !! can u upload it for me ? The pattern should be loaded first. To do so, go to Edit -> Preset Manager, and choose “Patterns” from the “Preset Type” drop down menu. Then, click the little arrow to the right of the Preset Type drop down menu, and click “Patterns” near the bottom of the pop-up menu. When the dialog box appears after that, just click Append, and you’ll get the pattern. … As for the letters, I guess you mean the smaller ones. When you use smaller font sizes you should use smaller values for all the layer styles too. An easy way to scale a layer style down is to right click the “fx” icon on the right side of the layer, and choose Scale Effects…. In the Scale Layer Effects dialog box, you can scale the Layer Style up to 1000% or down to 1%. So scale it down until it looks good. If the problem still exists please feel free to add a reply. As for scaling layer styles, please check this article I wrote for inspirationfeed.com, Tip 5: Scaling Layer Styles. This will help you understand what I mean. If it doesn’t, please leave a comment with the point you found unclear. It is better to leave comments here so that everyone can benefit, especially those who are facing the same problem. Hi, this is actually a very outstanding tutorial, and I really like it. But the link for the bow set 2 is somehow broken and the file could not be found, so can you check the link again, thank you and again, great tutorial. I posted a direct link to the set but it also doesn’t seem to work anymore, as the deviation has been deleted. But you can use any other bow such as this one, or this set. Thank you so much for the wonderful tutorial. The steps are explained so clearly. I have just started learning Photoshop and I’m very proud that I could complete this tutorial. Thank you so much! That’s amazing. Glad you were able to follow it easily. Thank so mutch for this works, i like it, i stay yours fan. I love Photoshop and i believe that with you i can do many thinks or become a great on creations. again thinsk, God bless you, your society and all your equipe. I’m really happy to know that. Your words and support mean a lot. I haven’t received any notes regarding the images not showing. Did you check your browser settings (no images browsing)? Can you see the images in the header and the sidebar? I really wish I can help but the images do show up for me and in different browsers, so hopefully you’ll be able to find a way to see them as well. Unfortunately, the user deleted the set. Please check this reply for alternative sets. It seems a pattern related problem. Are you sure you didn’t add or delete any part of the pattern before defining it? I got up to the bow. Too bad it’s missing. I’ll have to find another bow! That’s great to know! Glad you’re enjoying the tutorials and finding them easy to follow. Thank you for this Effect Text! Thank you very much for the comment and the link. The original set isn’t available anymore. I added some suggestions in a reply above, but will add those to the main article now. Wow…!!! What an amazing idea and execution..Also this is an equally amazing tutorial.. For past a week or so I used to cross paths to this tutorial, and every time I thought that — “Naaah… this must be way too complicated. It’s not for a beginner like me”.. And then I finally started going through the tutorial, and I must say that maybe executing this was hard for you to do for the first time, but going through this tutorial and creating the effect with so detailed and yet so simple tutorial was a piece of chocolate ( I will say piece of Cake when you do a tutorial on that :P)..
Anyways, great tutorial and great result..This world is beautiful because of creative people like you… Don’t let anything stop you.. Your words and support mean a lot! Very nice outcome indeed, in both tutorials. this is an outstanding work,I am speechless. can I use this tutorial for commercial using. You sure can, as long as you don’t sell the text effect (or the tutorial) itself as it is. Really happy to know you liked the tutorial and found it helpful. Unfortunately got completely stuck on step two trying to figure out how to fill the selection. I hate photoshop, this is so frustrating! You just need to change the Foreground color to whatever Fill color assigned, then choose the Paint Bucket Tool, and click inside the selection to fill it with the Foreground color. If you’re still unable to fill the selection, please feel free to leave a reply with a screenshot if possible. this is a really nice work. I am an absolute beginner, but I wanted this characters for the letters on my bike, so I followed your description and, wow, I got a beautiful result. Thank you so much. But now I have a problem which I dont know how to solve. I googled and read much, but I don’t know either what to do. The person who has to plot my text asked me about a cutline/vector along the outer line of the filling, because as it is he can only plot the innter part. Please, can anybody tell me what I have to do now? Unfortunately, this is not a vector art effect, it is raster. So you either need to work on bigger sizes and values from the beginning, or you need to use the Pen Tool to draw that outline. I’m not sure what exactly is the problem with the outer part though, why can’t it be outlined? I think it’s best to ask the person who suggested the edit, I’m sure they’ll have the answer you’re looking for. Very well done! Great outcome. Here is what I just did!! I love it….. Thanks A million!! !